You are not logged in. [Log In] Mt Whitney Zone » Forums » » The Chat Room » Chinook Sticks Landing on Mt. Hood. #53867 - 07/14/18 05:29 PM Chinook Sticks Landing on Mt. Hood. "The big chopper executed a 'pinnacle landing' right on the slope below the top of the mountain. This is when the crew drops the Chinook's ramp and balances the helicopter on its rear wheels while personnel climb aboard. 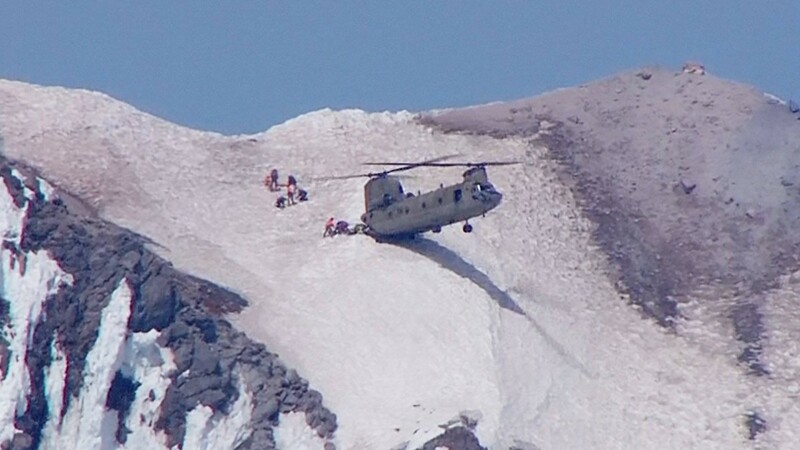 In this case, the pilots absolutely stuck their pinnacle landing as the CH-47 looks as if it was temporarily pinned immobile to the snow-covered slope. It was truly amazing work by all involved and you have to remember that those blades are spinning very close to the slope at or below eye level for those rescue climbers. Intense stuff!" This is so impressive. It's nerve wracking just looking at the photo. I can' even imagine what it feels like piloting that chopper at that point. Generated in 0.201 seconds in which 0.186 seconds were spent on a total of 14 queries. Zlib compression disabled.